The Collector’s Trove (http://www.thecollectorstrove.com) and Gary Con (https://www.garycon.com) would like to announce an ongoing series of events at Gary Con that pay special attention to the early days of wargaming prior to the introduction of Dungeons & Dragons. The special events will be gathered under the aegis: Legends of Wargaming. These time capsule events bring Gary Con attendees the classic board and miniature wargames that were a staple during the early days of the Lake Geneva Tactical Studies Association (LGTSA), International Federation of Wargaming (IFW), Castle & Crusade Society, Midwest Military Simulation Association (MMSA), and Gen Con. 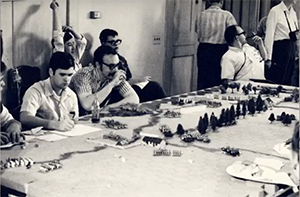 Each event will present the history of the game and its significance to the hobby of wargaming and even role-playing games. The original rules, vintage figures, and accurate accessories will be used during play. When possible, the events will involve individuals who played, refereed, and authored the games along side Gary Gygax and his friends during this golden age of wargaming. This is your chance to experience what it was like to play these games at the earliest Gen Cons and Gary Gygax’s own basement in Lake Geneva! The games will be taught and refereed so interest is all that is required by players. Even if you don’t sign up to play be sure to stop by to view the displays, ask questions, and watch the fun of classic wargaming!